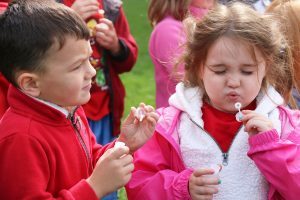 Kingsford kindergartners Mayson Fantom and Amy Greenlay blow bubbles as part of a mindfulness activity during the building’s recent Fall into Fitness event. OSWEGO – All students at Kingsford Park Elementary will ride along the healthy highway throughout the 2018-19 school year, thanks to supportive staff members who have committed to encouraging positive habits. Peyton Tynan, a second grader, jumps in the air in the middle of a burpee exercise, under the direction of representatives from Amnesty Crossfit. 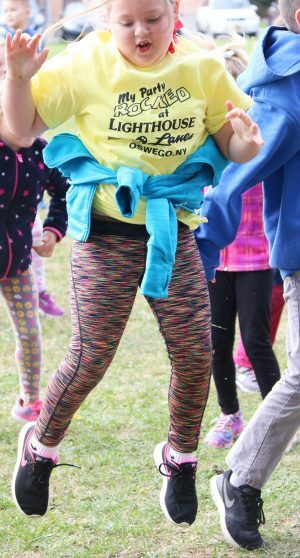 All KPS students participated in the Fall into Fitness event, which served as the school’s kick-off for the Healthy Highways program. The school’s recent Fall into Fitness event served as a kick-off for the building’s implementation of the county-wide Healthy Highways program. Supported by the Oswego City School District, Healthy Highways is a collaborative effort among local agencies to offer information and resources to children about making healthy choices. KPS physical education teacher Jeffrey Gordon and fifth grade teacher Jessica Burridge spearheaded Fall into Fitness, an afternoon of fun. Dressed as a traffic light, Gordon served as a walking reminder for students to make the best (green) choices, be careful of mediocre choices (yellow) and try to avoid poor choices (red). Several work stations were set up outside on the school grounds where students learned about physical and nutritional health, along with the need for a healthy mind, body and soul. They were able to participate in yoga, mindfulness activities, guess how much sugar is in various drinks, have a healthy snack, try CrossFit exercises, listen to a story and have free play. Throughout the school year, Gordon said he will utilize the Healthy Highways language, so students become more familiar with the vocabulary associated with healthy options. KPS teachers will also participate in Physical Fitness Fridays, where they are permitted to wear active attire to show their students how important it is to exercise and take care of their bodies. A healthy mind-body connection is vital to well-being.